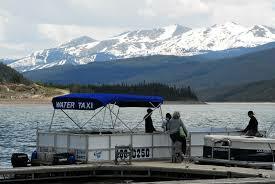 Scenic, Narrated Boat Ride on Lake Dillon. Our vessel, the Silver Queen, transports passengers between the Frisco and Dillon Marinas. Riders find our service to be easier, and less expensive, than renting a boat. We take care of the driving, so you can sit back, relax, and take in the view of the surrounding mountains. One-way and round-trip service is available from either marina. As always, you are welcome to bring dogs and bikes on board.